This is another TLN brainroad—a foundation for better second half decisions. but the image below scares me. social behavior that scares me. I want to end up somewhere different—maybe just dead. … But while the life expectancy of the individual and especially the individual knowledge worker has risen beyond anything anybody could have foretold at the beginning of the twentieth century, the life expectancy of the employing institution has been going down, and is likely to keep going down. When work for most people meant manual labor, there was no need to worry about the second half of your life. You simply kept on doing what you had always done. And if you were lucky enough to survive 40 years of hard work in the mill or on the railroad, you were quite happy to spend the rest of your life doing nothing. Today, however, most work is knowledge work, and knowledge workers are not “finished” after 40 years on the job, they are merely bored. We hear a great deal of talk about the mid-life crisis of the executive. At 45, most executives have reached the peak of their business careers, and they know it. After 20 years of doing very much the same kind of work, they are very good at their jobs. But they are not learning or contributing or deriving challenge and satisfaction from the job. And yet they are still likely to face another 20 if not 25 years of work. That is why managing oneself increasingly leads one to begin a second career. As said before: For the first time in human history, individuals can expect to outlive organizations. This creates a totally new challenge: What to do with the second half of one’s life? One can no longer expect that the organization for which one works at age thirty will still be around when one reaches age sixty. But also, forty or fifty years in the same kind of work is much too long for most people. They deteriorate, get bored, lose all joy in their work, “retire on the job” and become a burden to themselves and to everyone around them. This is not necessarily true of the very top achievers such as very great artists. Claude Monet (1840-1926), the greatest Impressionist painter, was still painting masterpieces in his eighties, and working twelve hours a day, even though he had lost almost all his eyesight. Pablo Picasso (1881-1973), perhaps the greatest Post-Impressionist painter, similarly painted till he died in his nineties and in his seventies invented a new style. The greatest musical instrumentalist of this century, the Spanish cellist Pablo Casals (1876-1973), planned to perform a new piece of music and practiced it on the very day on which he died at age ninety-seven. But these are the rarest of exceptions even among very great achievers. Neither Max Planck (1858-1947) nor Albert Einstein (1879-1955), the two giants of modern physics, did important scientific work after their forties. Planck had two more careers. After 1918—aged sixty—he reorganized German science. After being forced into retirement by the Nazis in 1933, he, in 1945, almost ninety, started once more to rebuild German science after Hitler’s fall. There is a great deal of talk today about the “mid-life crisis” of the executive. At age forty-five most executives have reached the peak of their business career and know it. After twenty years of doing very much the same kind of work, they are good at their jobs. But few are learning anything anymore, few are contributing anything anymore and few expect the job again to become a challenge and a satisfaction. Manual workers who have been working for forty years—in the steel mill for instance, or in the cab of a locomotive—are physically and mentally tired long before they reach the end of their normal life expectancy, that is, well before they reach even traditional retirement age. If they survive—and their life expectancy too has gone up to an average of seventy-five years or so—they are quite happy spending ten or fifteen years doing nothing, playing golf, going fishing, engaging in some minor hobby and so on. They are perfectly capable of functioning despite all kinds of minor complaints. And yet the original work that was so challenging when the knowledge worker was thirty has become a deadly bore when the knowledge worker is fifty and still he or she is likely to face another fifteen if not another twenty years of work. To manage oneself, therefore, will increasingly require preparing oneself for the second half of one’s life. The first is actually to start a second and different career (as Max Planck did). Often this means only moving from one kind of an organization to another. Typical are the middle-level American business executives who in substantial numbers move to a hospital, a university or some other nonprofit organization, around age forty-five or forty-eight, when the children are grown and the retirement pension is vested. The second answer to the question of what to do with the second half of one’s life is to develop a parallel career. A large and rapidly growing number of people—especially people who are very successful in their first careers—stay in the work they have been doing for twenty or twenty-five years. Many keep on working forty or fifty hours a week in their main and paid job. Some move from busy full-time to being part-time employees or become consultants. These are usually people who have been very successful in their first profession, as businessmen, as physicians, as consultants, as university professors. They love their work, but it no longer challenges them. In many cases they keep on doing what they have been doing all along, though they spend less and less of their time on it. People who manage the “second half” may always be a minority only. The majority may keep doing what they are doing now, that is, to retire on the job, being bored, keeping on with their routine and counting the years until retirement. But it will be this minority, the people who see the long working-life expectancy as an opportunity both for themselves and for society, who may increasingly become the leaders and the models. There is one requirement for managing the second half of one’s life: to begin creating it long before one enters it. 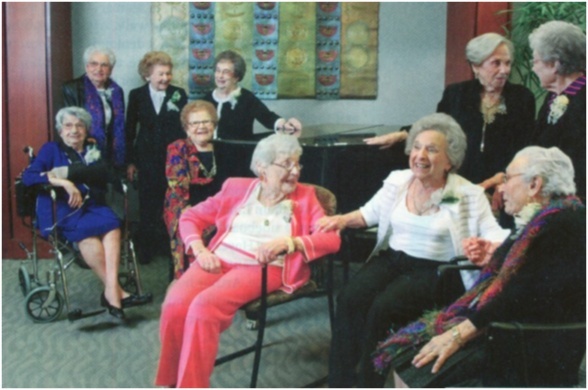 When it first became clear thirty years ago that working-life expectancies were lengthening very fast, many observers (including myself) believed that retired people would increasingly become volunteers for American nonprofit institutions. If one does not begin to volunteer before one is forty or so, one will not volunteer when past sixty. Similarly, all the social entrepreneurs I know began to work in their chosen second enterprise long before they reached their peak in their original business. The lawyer mentioned above began to do volunteer legal work for the schools in his state when he was around thirty-five. He got himself elected to a school board at age forty. When he reached fifty, and had amassed a substantial fortune, he then started his own enterprise to build and run model schools. He is, however, still working near-full-time as the lead counsel in the very big company that, as a very young lawyer, he had helped found. There is another reason that managing yourself will increasingly mean that the knowledge worker develops a second major interest, and develops it early. There is the competent college professor who at age forty-two realizes that she will stay forever in the small college in which she got her first appointment and will never get the professorship at the big university—even though she may be fully qualified for it. There are tragedies in one’s personal family life—the breakup of one’s marriage, the loss of a child. And then a second major interest—and not just another hobby—may make all the difference. The competent engineer passed over for promotion now knows that he has not been very successful in his job. One’s own family may break up, but in that outside activity there is still a community. This will be increasingly important in a society in which success has become important. Historically there was no such thing. The overwhelming majority of people did not expect anything but to stay in their “proper station,” as an old English prayer has it. The only mobility there was downward mobility. But this is clearly an impossibility. For a great many people there is, at best, absence of failure. For where there is success, there has to be failure. And then it is vitally important for the individual but equally for the individual’s family—that there be an area in which the individual contributes, makes a difference, and is somebody. That means having a second area, whether a second career, a parallel career, a social venture, a serious outside interest, all of them offering an opportunity for being a leader, for being respected, for being a success. The changes and challenges of Managing Oneself may seem obvious, if not elementary, compared to the changes and challenges discussed in the earlier chapters. And the answers may seem to be self-evident to the point of appearing naive. 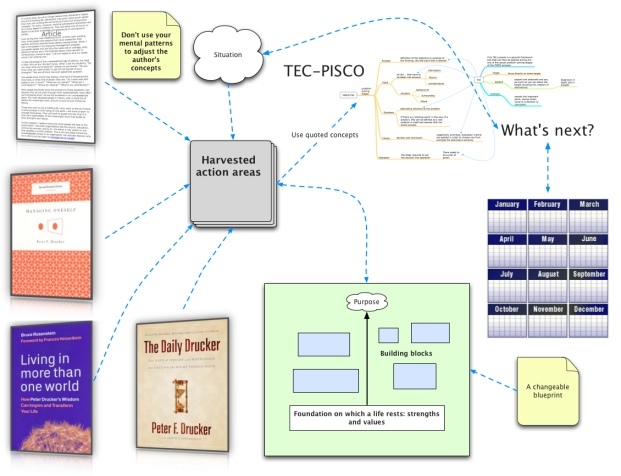 To be sure, many topics in the earlier chapters—for example, Being a Change Leader or some of the Information Challenges—are far more complex and require more advanced and more difficult policies, technologies, methodologies. But most of the new behavior—the new policies, technologies, methodologies—called for in these earlier chapters can be considered EVOLUTIONS. Managing Oneself is a REVOLUTION in human affairs. For in effect it demands that each knowledge worker think and behave as a Chief Executive Officer. It also requires an almost 180-degree change in the knowledge workers’ thoughts and actions from what most of us—even of the younger generation—still take for granted as the way to think and the way to act. Knowledge workers, after all, first came into being in any substantial numbers a generation ago. But also the shift from manual workers who do as they are being told—either by the task or by the boss to knowledge workers who have to manage themselves profoundly challenges social structure. For every existing society, even the most “individualist” one, takes two things for granted, if only subconsciously: Organizations outlive workers, and most people stay put. Managing Oneself is based on the very opposite realities: Workers are likely to outlive organizations, and the knowledge worker has mobility. In the United States MOBILITY is accepted. But even in the United States, workers outliving organizations—and with it the need to be prepared for a Second and Different Half of One’s Life—is a revolution for which practically no one is prepared. Nor is any existing institution, for example, the present retirement system. In the rest of the developed world, however, immobility is expected and accepted. In Germany, for instance, mobility—until very recently came to an end with the individual’s reaching age ten or, at the latest, age sixteen. If a child did not enter Gymnasium at age ten, he or she had lost any chance ever to go to the university. And the apprenticeship that the great majority who did not go to the Gymnasium entered at age fifteen or sixteen as a mechanic, a bank clerk, a cook—irrevocably and irreversibly—decided what work the person was going to do the rest of his or her life. Moving from the occupation of one’s apprenticeship into another occupation was simply not done even when not actually forbidden. The developed society that faces the greatest challenge and will have to make the most difficult changes is the society that has been most successful in the last fifty years: Japan. In lifetime employment it is the organization that manages the individual. And it does so, of course, on the assumption that the individual has no choice. The individual is being managed. I very much hope that Japan will find a solution that preserves the social stability, the community—and the social harmony that lifetime employment provided, and yet creates the mobility that knowledge work and knowledge workers must have. Far more is at stake than Japan’s own society and civic harmony. A Japanese solution would provide a model—for in every country a functioning society does require cohesion. Still, a successful Japan will be a very different Japan. But so will be every other developed country. The emergence of the knowledge worker who both can and must manage himself or herself is transforming every society. 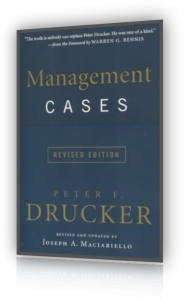 This book has intentionally confined itself to MANAGEMENT CHALLENGES. Even in this last chapter, it has talked about the individual, that is, the knowledge worker. But the changes discussed in this book go way beyond management. They go way beyond the individual and his or her career. According to Peter, good intentions (“I want to do something significant”) is only a starting point. The goal is results and performance that fulfills a clearly stated mission—something that needs doing—something that creates value for a customer (something that is important to them as human beings—not the typical marketing BS). Peter told me over and over, “All results are on the outside. Peter wasn’t speaking against money. He was simply saying that money alone won’t get results. It might even impede results. Finishing Well: How Pathfinders Transform Success to Significance. 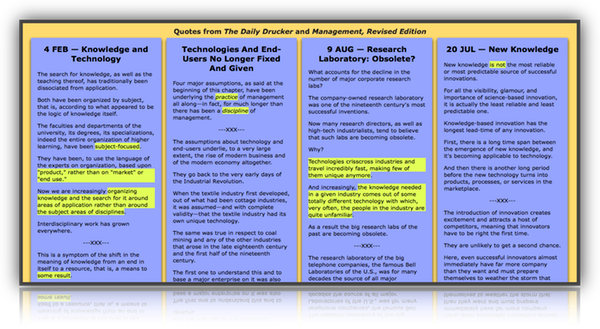 Be sure to see Ten Principles for Life II (Great advice drawn from three interviews with Peter Drucker) at the bottom of the page—calendarize this. 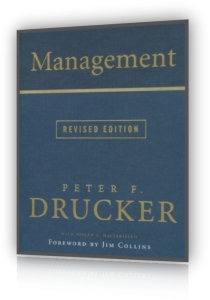 Most people think of Peter Drucker as the "father of modern management," which he was (though he was never very comfortable with that description). And while it's true that most of the very successful corporations owe a lot of their success to him, Peter increasingly turned his attention to the social sector—nonprofit organizations whose role is to look after the social needs of a culture. Peter felt strongly that while government has a critical role to play as policy maker, standard setter, and paymaster, it should not attempt to run social services because it has proven to be almost totally incompetent in that area. He also believed it was not a primary role of business to provide for the social needs of citizens. Instead, nonprofit agencies—of which more than fifty percent are churches and faith—based organizations—have the greatest potential for doing the greatest good. But as Peter would often say, "Don't mistake potential for performance," and devoted a great deal of his time helping the social sector, including churches, becoming more effective by becoming better managers. I know that some have criticized larger churches for becoming more "businesslike" by adopting modern management principles, but Peter was adamant that the function of management is to make the church more churchlike (or a hospital more hospital-like), not make it more businesslike. He saw such huge potential within churches to care for the social needs of the nation (see chapter titled "Citizenship Through the Social Sector" in Post-Capitalist Society) , especially within the ranks of Baby Boomers who will be looking for more meaningful options to retirement. Business enterprise is only one of the institutions of modern society, and business managers are by no means our only managers. Service institutions are equally institutions and, therefore, equally in need of management. Some of the most familiar of these institutions are government agencies, the armed services, schools, colleges, universities, research laboratories, hospitals and other health-care institutions, unions, professional practices such as the large law firm, and professional, industry, and trade associations. They all have people who are paid for doing the management job, even though they may be called administrators, commanders, directors, or executives, rather than managers. Education, health care, knowledge, and mobility—not just more food, clothing, and shelter—are the fruits of our society's increased economic capacities and productivity. The service institutions themselves have become "management conscious." Increasingly they turn to business to learn management. In all service institutions, manager development, management by objectives, and many other concepts and tools of business management are now common. This is a healthy sign, but it does not mean that the service institutions understand the problems of managing themselves. It only means that they begin to realize that at present they are not being managed. There is another and very different response to the performance crisis of the service institutions. A growing number of critics have come to the conclusion that service institutions are inherently unmanageable and incapable of performance. Some go so far as to suggest that they should, therefore, be dissolved. But there is not the slightest evidence that today's society is willing to do without the contributions the service institutions provide. The people who most vocally attack the shortcomings of the hospitals want more and better health care. Those who criticize public schools want better, not less, education. The voters bitterest about government bureaucracy vote for more government programs. We have no choice but to learn to manage the public-service institutions for performance. And they can be managed for performance. Different classes of service institutions need different structures. But all of them need first to impose on themselves discipline of the kind imposed by leaders of the institutions in the examples in the previous chapters. They need to bring alternative definitions into the open and consider them carefully. They should perhaps even work out some balance between the different and conflicting definitions of mission (as did the presidents of the emerging American universities—see later in this chapter). They must derive clear objectives and goals from their definition of function and mission. They then must set priorities that enable them to select targets, to set standards of accomplishment and performance—that is, to define the minimum acceptable results, to set deadlines, to go to work on results, and to make someone accountable for results. They must define measurements of performance—customer-satisfaction measurements for the performance of Medicare services, or the number of households supplied with electric power (a quantity much easier to measure). They must use these measurements to feed back on their efforts. That is, they must build self-control by results into their system. Finally, they need an organized review of objectives and results, to weed out those objectives that no longer serve a purpose or have proven unattainable. They need to identify unsatisfactory performance and activities that are outdated or unproductive, or both. And they need a mechanism for dropping such activities rather than wasting money and human energies where the results are poor. The last requirement may be the most important one. Without a market test, the service institution lacks the built-in discipline that forces a business eventually to abandon yesterday—or else go bankrupt. Assessing and abandoning low-performance activities in service institutions, outside and inside business, would be the most painful but also the most beneficial improvement. As the examples have shown, no success is "forever." Yet it is even more difficult to abandon yesterday's success than it is to reappraise a failure. A once-successful project gains an air of success that outlasts the project's real usefulness and disguises its failings. In a service institution particularly, yesterday's success becomes "policy," "virtue," "conviction," if not holy writ. The institution must impose on itself the discipline of thinking through its mission, its objectives, and its priorities, and of building in feedback control from results and performance on policies, priorities, and action. Otherwise, it will gradually become less and less effective. We are in such a welfare mess today in the United States largely because the welfare program of the 1930s was such a success. We could not abandon it and, instead, misapplied it to the radically different problem of the inner-city poor. To make service institutions perform, it should by now be clear, does not require great leaders. The essentials of this system are not too different from the essentials of performance in a business enterprise, but the application will be quite different. The service institutions are not businesses; performance means something quite different in them. The applications of the essentials differ greatly for different service institutions. As our later examples will show, there are at least three different kinds of service institutions—institutions that are not paid for performance and results, but for efforts and programs.